Milk Chocolate Rabbits are smooth milk chocolate pieces with a foil wrap picture of a rabbit. Made by Sorini these Italian chocolates are great to add to the Easter basket or include in the Easter egg hunt. The mini Easter bunnies are roughly 5 by 2cm in an oblong shape and a half cm thick. There are approx. 32 rabbits in the 200g bag and approx. 160 in a kilo bag. Milk Chocolate Rabbits are smooth milk chocolate pieces with a foil wrap picture of a rabbit. 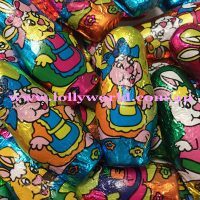 Made by Sorini these Italian chocolates are great to add to the Easter basket or include in the Easter egg hunt. The chocolates are roughly 5 by 2cm in an oblong shape and a half cm thick. There are approx. 32 rabbits in the 200g bag and approx. 160 in a kilo bag.